Malaysians really love buffets. Who doesn’t really – imagine, an all you can eat meal for a set price is a great deal! 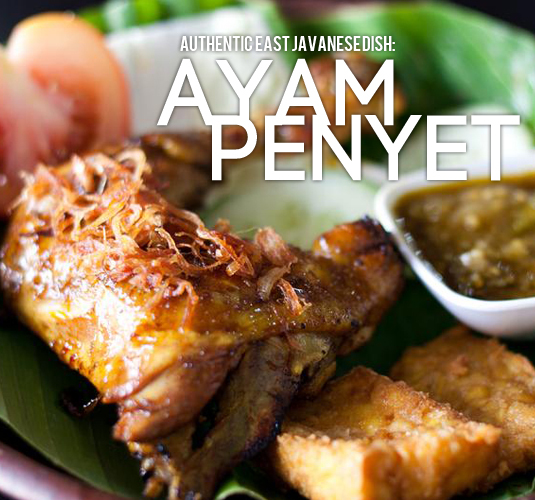 With our diverse culture and also the import of various cuisine styles from around the globe, Malaysians are spoilt for choice when it comes to buffet spreads.From humble steamboat buffets in your neighbourhood to extravagant hotel continental buffets, we at GoMakan will make it easier for you to decide where to dine with our list of great all-you-can-eat spots in Klang Valley! 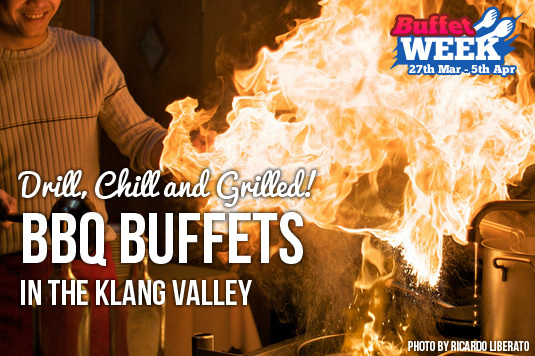 This time around let’s take a look at several BBQ buffets; buffets which offer a selection of free flow grilled dishes or feature a grill at the table for customers to cook from a selection of marinated meats. Let’s drill down the list and grilled! Address : Jalan Radin Bagus, Bandar Baru Sri Petaling, 57000 Kuala Lumpur. Hours : 12noon till 11pm daily, closed on Wednesdays. 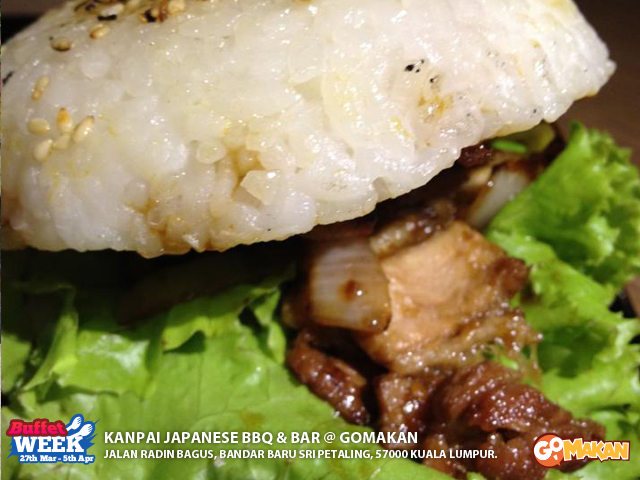 Nestled in a shoplot in Sri Petaling, Kanpai Japanese BBQ & Bar resembles the popular yakiniku joints in Japan where customers go for some grilled beef or pork with a nice cold beverage after a hard day’s work (“kanpai” is the term used when people clink their glass in Japan, similar to “cheers” or our local “yum seng!”). Rates are RM35++ per pax for 3 hour of dining time with free flow ingredients for the grill, soft drinks, green tea and ice cream. Address : Lot 4, Level 3, Great Eastern Mall, No 303, Jalan Ampang, 50450 Kuala Lumpur. 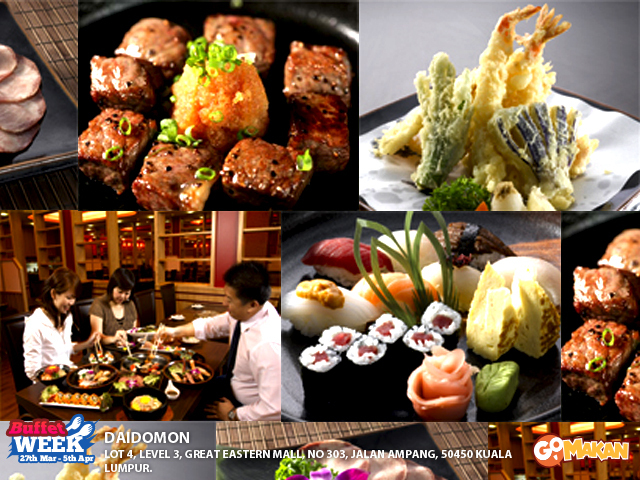 Daidomon is a pork-free Japanese yakiniku buffet restaurant located in Great Eastern Mall in Ampang, making it easily accessible and a suitable choice for family friendly gatherings. A selection of local and Japanese dishes is set out for customers to eat as they please while the meats for grilling are ordered from a buffet-only menu. Rates differ between lunch (RM39.90++ Mon-Fri, RM45.90++ weekends and public holidays) and dinner buffets (RM45.90++ Mon-Thur, RM55.90++ Fri, weekends and public holidays). Address : No.77, Jalan SS22/19, 47400 Damansara Jaya. 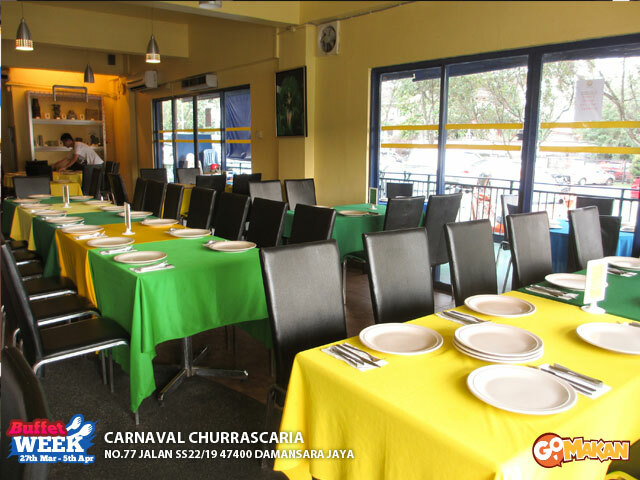 Green & Yellow themes brings up the joy and hunger feelings in Carnaval Churrascaria. 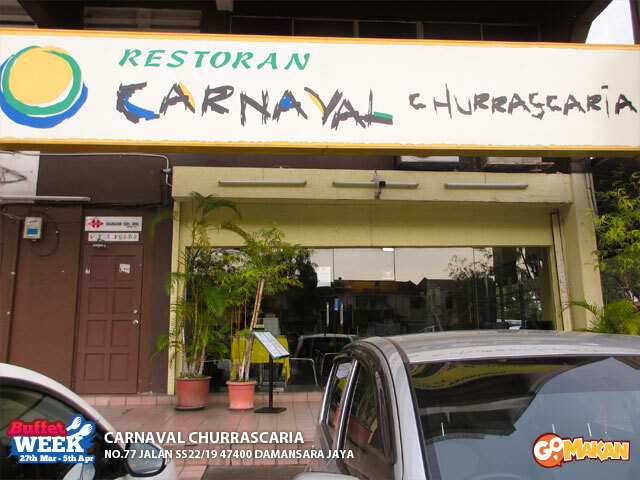 A churrascaria is an eatery that serves meat prepared in the Churrasco style, which roughly means ‘barbeque’ in Portuguese. At Carnaval Churrascaria the barbequed meat is served to customers via a method known as espeto corrido or rodízio where waiters bring large skewers of meat to each table and slice a portion of meat onto the customer’s plate! This halal buffet is available every evening at the rate of RM58++ per person for unlimited servings of grilled meat and their salad bar (drinks are sold separately). Address : Lot 3370, Jalan Kemboja, Seksyen U5, Kampung Melayu Subang, 40150 Shah Alam. 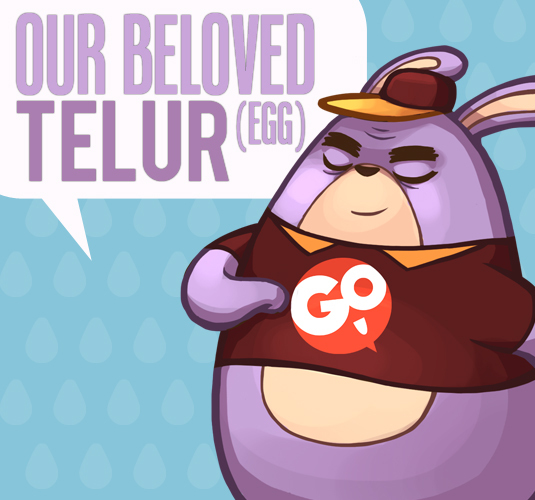 Hours : 6pm – 12am Tuesday – Sunday, closed on Mondays. More Space. More natural breeze. Sometimes people can’t decide between steamboat and BBQ buffets, so a lot of the local buffets opt to go for variety and combine the two. 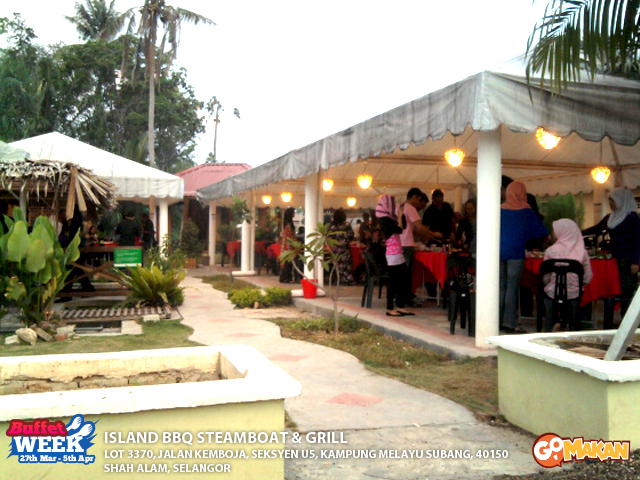 Island BBQ Steamboat & Grill in Shah Alam is one such establishment where each table has a setup that consists of a metal plate for grilling and a pot of soup stock in the middle of the plate for steamboat. 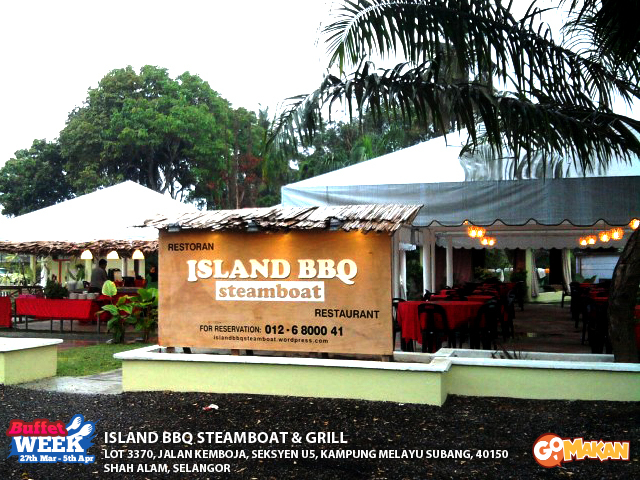 Island BBQ Steamboat & Grill offers a wide buffet spread with ingredients like fresh prawns, chicken fillet, squid, marinated meats and more with an entrance fee of RM21.90++ for adults and RM9.90++ per child (children aged 4 and below dine for free). Address : Sri Acapella Service Apartment, No.1 Jalan Lompat Tinggi 13/33, Seksyen 13, 40100 Shah Alam. Al fresco or indoor dining? You choose. 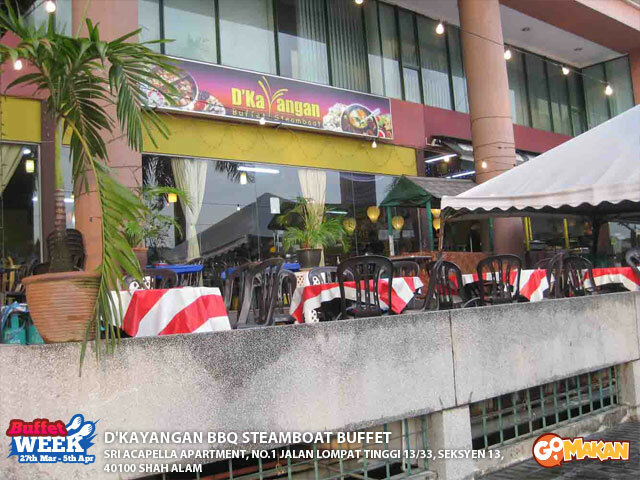 D’Kayangan BBQ Steamboat Buffet in Shah Alam is a halal buffet which operates 5pm to 12am daily, offering both steamboat and grill options. For an entrance fee of RM24.45++ for adults and RM10.90++ for children aged 4-10 years old, customers are spoilt for choice by a buffet spread spanning more than 150 dishes to choose from. The star of D’Kayangan BBQ Steamboat Buffet is their spit roasted whole lamb which the staff will carve and serve to customers. Address : No.1, Jalan Kasuarina 5/KS7, Bandar Botanic, 41200 Klang. Hours : 5pm-11.30pm (Wednesday – Monday), closed on Tuesdays. 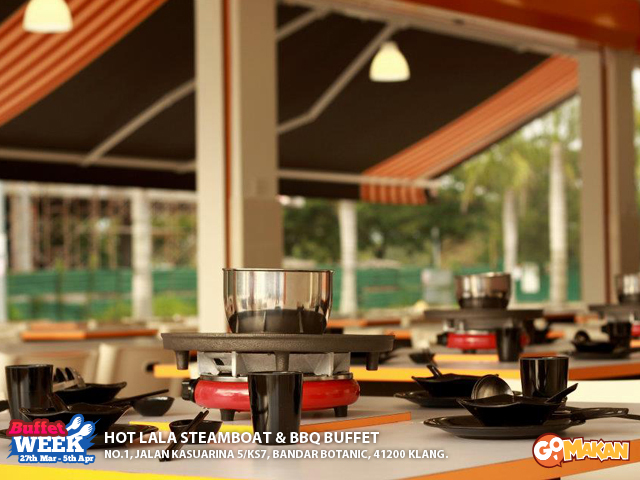 Hot Lala Steamboat & BBQ Buffet in Bandar Botanic, Klang is another of the popular steamboat and BBQ hybrid buffets. Their business hours are 5pm – 11:30pm every day except Tuesdays, but they make exceptions and are open for business if a Tuesday happens to be a public holiday. Dinner rates are RM28 nett for adults and RM10 nett for children 91cm-120cm in height. Students get a special rate of RM23 nett and they also offer birthday promotional packages. (Cheras) Restoran Sri Q Thai, Lot 30632 Jalan Tun Perak 5 Taman Tun Perak 43200 Cheras Selangor. Known as Restoran Q Thai Village in Ampang or Restoran Sri Q Thai in Cheras, Q Thai Steamboat like its name features a Thai and local cuisine fusion buffet. They offer six Thai soup stock choices and over 150 dishes for customers to enjoy via steamboat or grill at their tables. All that for only RM27+ per adult and RM14+ per child! 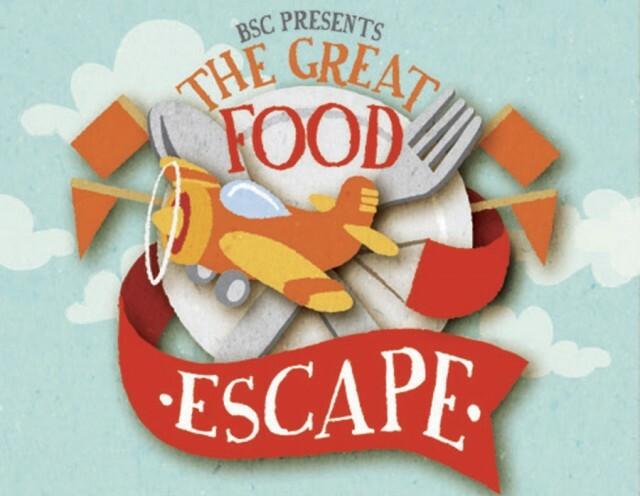 They also offer a 20% discount off their a la carte menu for buffet patrons. Address : 254, Batu 17, Lorong Manggis, Kampung Cempedak, Kuang 48050 Rawang, Selangor. Café D’Manggis Steamboat & BBQ might require a little more effort to visit as it’s located in Rawang but if you’re a fan of Malay food it might be well worth your visit. 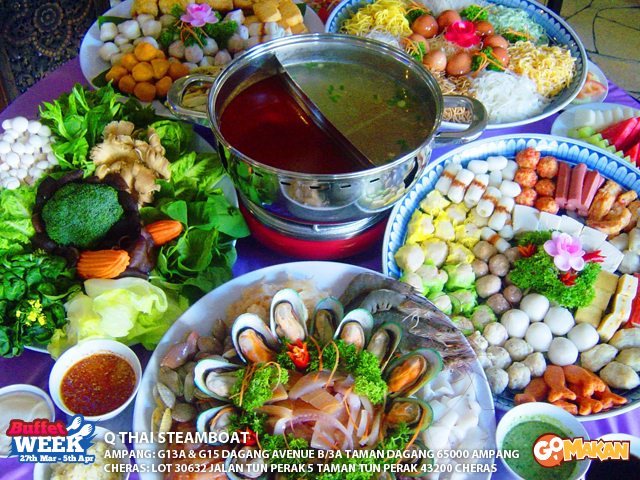 Rates are RM20 nett per adult and RM10 nett per child aged 4 to 12 for their Steamboat + BBQ buffet dinner. 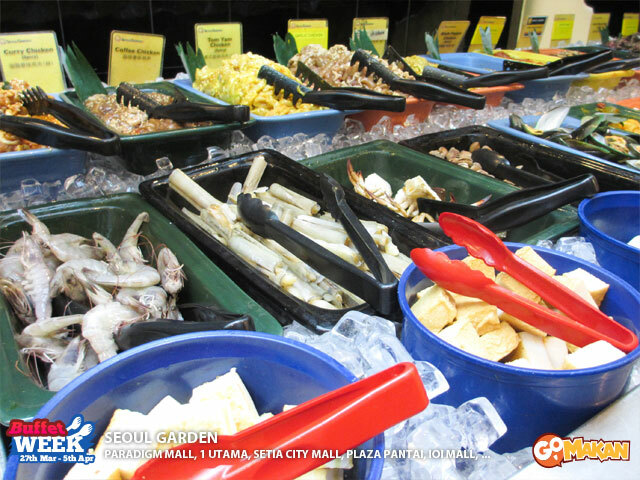 The buffet offers a mix of seafood and marinated meats for grilling, Malay dishes, ulam, traditional kuih and much more. Café D’Manggis Steamboat & BBQ also caters to group reservations and has a private hall available for customers to host functions. Locations : Paradigm Mall, 1 Utama, Setia City Mall, Plaza Pantai, IOI Mall. Hours : 11.30am – 10pm, daily. 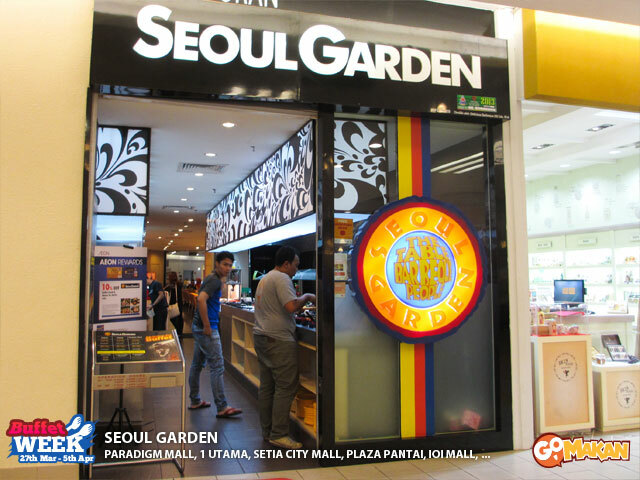 A halal chain of Korean style BBQ and hotpot buffet that’s been making waves lately on our shores, Seoul Garden is quickly becoming one of the popular choices for families and youths to dine in malls. Marinated beef and chicken, fish cakes, and plenty of Korean side dishes make up their colourful buffet spread. Rates are RM28.88++ per adult and RM16++ per child for lunch, and RM38.88++ per adult and RM20++ per child for dinner. Special discounts are applicable for senior citizens (age 55 and above) and students. Address : No.2-3A Jalan PJU 5/9 Dataran Sunway, Kota Damansara 47810 Petaling Jaya, Selangor. 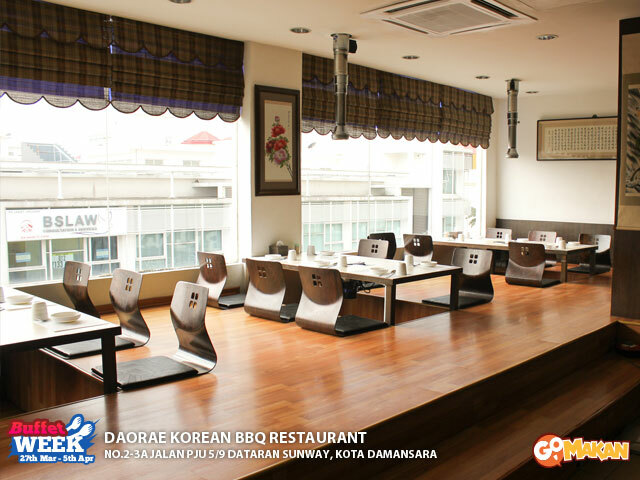 Situated in the trendy neighbourhood of Kota Damansara, Daorae is one of many recently popular Korean BBQ restaurants emerging around Klang Valley. Daorae does not offer a buffet on a predetermined time basis but on special occasions they run a dinner buffet at RM45++ per person (drinks excluded). While waiting for Daorae’s buffet why not try out their signature Korean BBQ and various flavourful Korean dishes? Not enough? Wait until our next articles. More Buffets coming up!